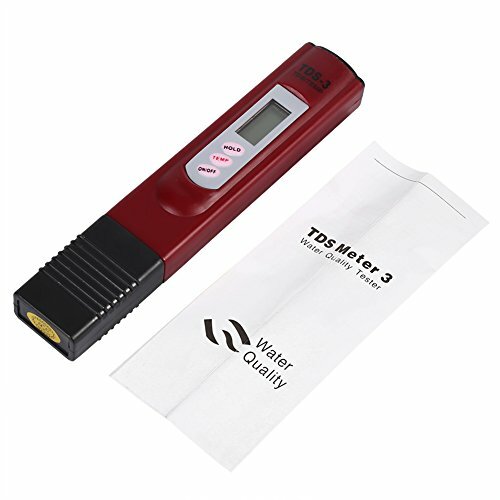 The LCD digital TDS meter tester is used for testing the filter water quality purity, to check the performance of your water. In order to make sure you always drink pure and safe water, the TDS meter tester is recommended for every family. 1. Please allow 0~1inch error due to manual measurement. Thanks for your understanding! MULTI-PURPOSE:The TDS meter tester can be used in:water purifiers and filters,Food (vegetable,fruits) and drink quality monitoring, pools and spas, aquariums, hydroponics ans so on. MULTI-FUNCTION:Saves measurements for convenient reading and recording.Turns off meter after 10 minutes of non-use to conserve batteries.Press "TEMP" button can shift temperature meter between fahrenheit degree and centigrade degree. APPLICABLE INDUSTRIES: Water laboratories, CDC, the aquaculture industry, hospitals, swimming pools, household tap water quality testing. MEASURES RANGE: 0-9990ppm, with a resolution of 1ppm. From 1,000 to 9,990ppm, the resolution is 10ppm, indicated by drinking x 10image, factory calibrated.